This article is about the Greek island of Rhodes. For other uses, see Rhodes (disambiguation). "Rodi" redirects here. For other uses, see Rodi (disambiguation). Rhodes (Greek: Ρόδος, Ródos [ˈroðos]) is the largest of the Dodecanese islands of Greece and is also the island group's historical capital. Administratively the island forms a separate municipality within the Rhodes regional unit, which is part of the South Aegean administrative region. The principal town of the island and seat of the municipality is Rhodes. The city of Rhodes had 50,636 inhabitants in 2011. It is located northeast of Crete, southeast of Athens and just off the Anatolian coast of Turkey. Rhodes' nickname is The island of the Knights, named after the Knights of Saint John of Jerusalem, who once conquered the land. Historically, Rhodes was famous worldwide for the Colossus of Rhodes, one of the Seven Wonders of the Ancient World. The Medieval Old Town of the City of Rhodes has been declared a World Heritage Site. Today, it is one of the most popular tourist destinations in Europe. The name of the U.S. state of Rhode Island is thought to be based on this island. The Travels of Sir John Mandeville incorrectly reports that Rhodes was formerly called "Collosus", through a conflation of the Colossus of Rhodes and Paul's Epistle to the Colossians, which refers to Colossae. The island of Rhodes is shaped like a spearhead, 79.7 km (49.5 mi) long and 38 km (24 mi) wide, with a total area of approximately 1,400 square kilometres (541 sq mi) and a coastline of approximately 220 km (137 mi). Limestone is the main bedrock. The city of Rhodes is located at the northern tip of the island, as well as the site of the ancient and modern commercial harbours. The main air gateway (Diagoras International Airport, IATA code: RHO) is located 14 km (9 mi) to the southwest of the city in Paradisi. The road network radiates from the city along the east and west coasts. The interior of the island is mountainous, sparsely inhabited and covered with forests of pine (Pinus brutia) and cypress (Cupressus sempervirens). While the shores are rocky, the island has arable strips of land where citrus fruit, wine grapes, vegetables, olives and other crops are grown. The Rhodian population of fallow deer was found to be genetically distinct in 2005, and to be of urgent conservation concern. In Petaloudes Valley (Greek for "Valley of the Butterflies"), large numbers of tiger moths gather during the summer months. Mount Attavyros, at 1,216 metres (3,990 ft), is the island's highest point of elevation. Earthquakes include the 226 BC earthquake that destroyed the Colossus of Rhodes; one on 3 May 1481 which destroyed much of the city of Rhodes; and one on 26 June 1926. On 15 July 2008, Rhodes was struck by a 6.3 magnitude earthquake causing minor damage to a few old buildings and one death. Rhodes has a hot-summer Mediterranean climate (Csa in the Köppen climate classification). In the 15th century BC, Mycenaean Greeks invaded. After the Bronze Age collapse, the first renewed outside contacts were with Cyprus. Homer mentions that Rhodes participated in the Trojan War under the leadership of Tlepolemus. In the 8th century BC, the island's settlements started to form, with the coming of the Dorians, who built the three important cities of Lindos, Ialyssos and Kameiros, which together with Kos, Cnidus and Halicarnassus (on the mainland) made up the so-called Dorian Hexapolis (Greek for six cities). In Pindar's ode, the island was said to be born of the union of Helios the sun god and the nymph Rhodos, and the cities were named for their three sons. The rhoda is a pink hibiscus, native to the island. Diodorus Siculus added that Actis, one of the sons of Helios and Rhode, travelled to Egypt. He built the city of Heliopolis and taught the Egyptians astrology. In 408 BC, the cities united to form one territory. They built the city of Rhodes, a new capital on the northern end of the island. Its regular plan was, according to Strabo, superintended by the Athenian architect Hippodamus. Following the death of Alexander, his generals vied for control of the kingdom. Three—Ptolemy, Seleucus, and Antigonus—succeeded in dividing the kingdom among themselves. Rhodes formed strong commercial and cultural ties with the Ptolemies in Alexandria, and together formed the Rhodo-Egyptian alliance that controlled trade throughout the Aegean in the 3rd century BC. The city developed into a maritime, commercial and cultural center; its coins circulated nearly everywhere in the Mediterranean. Its famous schools of philosophy, science, literature and rhetoric shared masters with Alexandria: the Athenian rhetorician Aeschines, who formed a school at Rhodes; Apollonius of Rhodes; the observations and works of the astronomers Hipparchus and Geminus, the rhetorician Dionysius Thrax. Its school of sculptors developed, under Pergamese influence, a rich, dramatic style that can be characterized as "Hellenistic Baroque". Agesander of Rhodes, with two other Rhodian sculptors, carved the famous Laocoön group, now in the Vatican Museums, and the large sculptures rediscovered at Sperlonga in the villa of Tiberius, probably in the early Imperial period. Throughout the 3rd century BC, Rhodes attempted to secure her independence and her commerce, most especially her virtual control over the grain trade in the eastern Mediterranean. Both of these goals were dependent upon no one of the three great Hellenistic states achieving dominance, and consequently the Rhodians pursued a policy of maintaining a balance of power among the Antigonids, Seleucids and Ptolemies, even if that meant going to war with her traditional ally, Egypt. To this end they employed as leverage their economy and their excellent navy, which was manned by proverbially the finest sailors in the Mediterranean world: "If we have ten Rhodians, we have ten ships. "[citation needed] The Rhodians also established their dominance on the shores of Caria across from their island, which became known as the "Rhodian Peraia". It extended roughly from the modern city of Muğla (ancient Mobolla) in the north and Kaunos bordering Lycia in the south, near the present-day Dalyan, Turkey. Despite being exhausted by the titanic struggle against Hannibal (218-201 BC) the Romans agreed to intervene, having already been stabbed in the back by Philip during the war against Carthage. The Senate saw the appeal from Rhodes and her allies as the opportunity to pressure Philip. The result was the Second Macedonian War (200-196 BC), which ended Macedon's role as a major player and preserved Rhodian independence. [citation needed] Rhodian influence in the Aegean was cemented through the organization of the Cyclades into the Second Nesiotic League under Rhodian leadership. After surrendering its independence Rhodes became a cultural and educational center for Roman noble families and was especially noted for its teachers of rhetoric, such as Hermagoras and the unknown author of Rhetorica ad Herennium. At first, the state was an important ally of Rome and enjoyed numerous privileges, but these were later lost in various machinations of Roman politics. Cassius eventually invaded the island and sacked the city. In the early Imperial period Rhodes became a favorite place for political exiles. In the 1st century AD, the Emperor Tiberius spent a brief term of exile on Rhodes. Saint Paul brought Christianity to people on the island. Rhodes reached her zenith in the 3rd century. In ancient times there was a Roman saying: "hic Rhodus, hic salta! "—"Here is Rhodes, jump here", an admonition to prove one's idle boasts by deed rather than talk. It comes from an Aesop's fable called "The Boastful Athlete" and was cited by Hegel, Marx, and Kierkegaard. In 395 with the division of the Roman Empire, the long Byzantine period began for Rhodes. 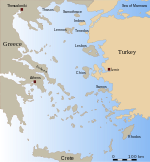 In Late Antiquity, the island was the capital of the Roman province of the Islands, headed by a praeses (hegemon in Greek), and encompassing most of the Aegean islands, with twenty cities. Correspondingly, the island was also the metropolis of the ecclesiastical province of Cyclades, with eleven suffragan sees. Beginning from ca. 600 AD, its influence in maritime issues was manifested in the collection of maritime laws known as "Rhodian Sea Law" (Nomos Rhodion Nautikos), accepted throughout the Mediterranean and in use throughout Byzantine times (and influencing the development of admiralty law up to the present). [citation needed] In 622/3, during the climactic Byzantine–Sasanian War of 602–628, Rhodes was captured by the Sasanian navy. Rhodes was occupied by the Islamic Umayyad forces of Caliph Muawiyah I in 654, who carried off the remains of the Colossus of Rhodes. The island was again captured by the Arabs in 673 as part of their first attack on Constantinople. When their fleet was destroyed by Greek fire before Constantinople and by storms on its return trip, however, the island was evacuated in 679/80 as part of the Byzantine–Umayyad peace treaty. In 715 the Byzantine fleet dispatched against the Arabs launched a rebellion at Rhodes, which led to the installation of Theodosios III on the Byzantine throne. From the early 8th to the 12th centuries, Rhodes belonged to the Cibyrrhaeot Theme of the Byzantine Empire, and was a centre for shipbuilding and commerce. In c. 1090, it was occupied by the forces of the Seljuk Turks, not long after the Battle of Manzikert. Rhodes was recaptured by the Emperor Alexios I Komnenos during the First Crusade. As Byzantine central power weakened under the Angeloi emperors (1185–1204), in the first half of the 13th century, Rhodes became the centre of an independent domain under Leo Gabalas and his brother John, until it was occupied by the Genoese in 1248–1250. The Genoese were evicted by the Empire of Nicaea, after which the island became a regular province of the Nicaean state (and after 1261 of the restored Byzantine Empire). In 1305, the island was given as a fief to Andrea Morisco, a Genoese adventurer who had entered Byzantine service. But, Rhodes was controlled by Menteşe, was one of Anatolian beyliks between 1300 and 1314. In 1306–1310, the Byzantine era of the island's history came to an end when the island was occupied by the Knights Hospitaller. Under the rule of the newly named "Knights of Rhodes", the city was rebuilt into a model of the European medieval ideal. Many of the city's famous monuments, including the Palace of the Grand Master, were built during this period. The strong walls which the knights had built withstood the attacks of the Sultan of Egypt in 1444, and a siege by the Ottomans under Mehmed II in 1480. Eventually, however, Rhodes fell to the large army of Suleiman the Magnificent in December 1522. The Sultan deployed 400 ships delivering 100,000 men to the island (200,000 in other sources). Against this force the Knights, under Grand Master Philippe Villiers de L'Isle-Adam, had about 7,000 men-at-arms and their fortifications. The siege lasted six months, at the end of which the surviving defeated Hospitallers were allowed to withdraw to the Kingdom of Sicily. Despite the defeat, both Christians and Muslims seem to have regarded the conduct of Villiers de L'Isle-Adam as extremely valiant, and the Grand Master was proclaimed a Defender of the Faith by Pope Adrian VI (see Knights of Cyprus and Rhodes). The knights would later move their base of operations to Malta. Rhodes was thereafter a possession of the Ottoman Empire (see Sanjak of Rhodes) for nearly four centuries. The island was populated by ethnic groups from the surrounding nations, including Jews. Under Ottoman rule, they generally did fairly well, but discrimination and bigotry occasionally arose. In February 1840, the Jews of Rhodes were falsely accused of ritually murdering a Christian boy. This became known as the Rhodes blood libel. In 1912, Italy seized Rhodes from the Turks during the Italo-Turkish War. The island's population was spared the "exchange of the minorities" between Greece and Turkey. Rhodes and the rest of the Dodecanese Islands were assigned to Italy in the Treaty of Ouchy and were supposed to be given back but were not. Turkey ceded them officially in the 1923 Treaty of Lausanne. It then became the core of their possession of the Isole Italiane dell'Egeo. Following the Italian Armistice of 8 September 1943, the British attempted to get the Italian garrison on Rhodes to change sides. This was anticipated by the German Army, which succeeded in occupying the island with the Battle of Rhodes. In great measure, the German occupation caused the British failure in the subsequent Dodecanese Campaign. The Turkish Consul Selahattin Ülkümen succeeded, at considerable risk to himself and his family, in saving 42 Jewish families, about 200 persons in total, who had Turkish citizenship or were members of Turkish citizens' families. On 8 May 1945 the Germans under Otto Wagener surrendered Rhodes as well as the Dodecanese as a whole to the British, who soon after then occupied the islands as a military protectorate. In 1949, Rhodes was the venue for negotiations between Israel and Egypt, Jordan, Lebanon, and Syria, concluding with the 1949 Armistice Agreements. The name of the US state of Rhode Island is based on a reference to Rhodes by Italian explorer Giovanni da Verrazzano. In a 1524 letter detailing his excursion into the waters around either Block Island or Aquidneck Island Verrazano wrote that he "discovered an Ilande in the form of a triangle, distant from the maine lande 3 leagues, about the bignesse of the Ilande of the Rodes". The Colossus of Rhodes was considered to be one of the Seven Wonders of the Ancient World. This giant bronze statue was documented as once standing at the harbour. It was completed in 280 BC and destroyed in an earthquake in 224 BC. No trace of the statue remains today. Historical sites on the island of Rhodes include the Acropolis of Lindos, the Acropolis of Rhodes with the Temple of Pythian Apollo and an ancient theatre and stadium, ancient Ialysos, ancient Kamiros, the Governor's Palace, Rhodes Old Town (walled medieval city), the Palace of the Grand Masters, Kahal Shalom Synagogue in the Jewish Quarter, the Archeological Museum, the ruins of the castle of Monolithos, the castle of Kritinia, St. Catherine Hospice and Rhodes Footbridge. The predominant religion is Greek Orthodox; the island is the seat of the Metropolis of Rhodes. There is a significant Latin Catholic minority on the island of 2,000, many of whom are descendants of Italians who remained after the end of the Italian occupation, pastorally served by the Roman Catholic Archdiocese of Rhodes. Rhodes has a Turkish Muslim minority, a remnant from Ottoman Turkish times who were not required in the population exchange of 1923-24 to leave because the Dodecanese Islands were under Italian administration. They are organized around the Turkish Association of Rhodes (Turkish: Rodos Türk Derneği), which gives the figure 3,500 for the population they bring together and represent for the island. The number of the Turks in Rhodes could be as many as 4,000. The Jewish community of Rhodes goes back to the first century AD. Kahal Shalom Synagogue, established in 1557, during the Ottoman era, is the oldest synagogue in Greece and still stands in the Jewish quarter of the old town of Rhodes. At its peak in the 1920s, the Jewish community was one-third of the town's total population. In the 1940s, there were about 2000 Jews of various ethnic backgrounds. The Nazis deported and killed most of the community during the Holocaust. Kahal Shalom has been renovated with the help of foreign donors but few Jews live year-round in Rhodes today, so services are not held on a regular basis. The Jewish Museum of Rhodes was established in 1997 to preserve the Jewish history and culture of the Jews of Rhodes. It is adjacent to the Kahal Shalom Synagogue. The municipality has an area of 1400.681 km2. It covers the island of Rhodes and a few uninhabited offshore islets. Rhodes city was the capital of the former Dodecanese Prefecture. Rhodes is the most populated island of the South Aegean Region. Rhodes International Airport, "Diagoras": public airport, 14 km (9 mi) southwest of Rhodes City, third in international passenger volume and fourth in total passenger volume in Greece. Rhodes Maritsa Airport: closed to public, near Maritsa village. Built in 1938 by the Italians, it was the first airport of the island and was the public airport until 1977. Nowadays, it serves the Hellenic Air Force and is sometimes used for car races. Rhodes-Lindos National Avenue (Greek National Road 95): Four and two lane, runs mainly inland north to south and connects Rhodes City with Lindos. [citation needed] Part from Rhodes Town until Kolympia is now 4 lanes, the rest until Lindos is 2 lanes. Rhodes Town Ring Road (Phase 1): Beginning from the new marina and ending to Rhodes-Kallithea province avenue is a four lane expressway. Further widening of Rhodes-Lindos National Avenue (Greek National Road 95) from Kolympia to Lindos. This is to be four lane with a jersey barrier in the middle. A tender is expected to take place by end of 2019 so as constructions can begin. Ring Road phases 2, 3 and 4 pending; phase 2 will extend the expressway to Greek National Road 95 and then to Rhodes General Hospital where it supposedly will connect to also planned new Rhodes City-Airport expressway. In June 2018 Rhodes municipality stated that plans for the final 700 meters of the ring road leading to Akandia Port are pending approval. Phases 3 and 4 which plan to run the ring road from hospital hill down to Ixia and then through Kritika back to the town will most probably never occur. Football: AS Rodos and Diagoras F.C. are the island's biggest teams and rivals. Both competed in 2017-18 season at the national level third tier (Gamma Ethniki) along with GAS Ialysos but at season end the former relegated while Diagoras and Ialysos remained. Kremasti town team, Foivos, will join them for 2018-19 season as it was promoted. Local football leagues (organized at the prefecture level) contain three divisions with more than 50 teams. Many stadia are grass covered. Basketball: Colossus BC sponsors professional basketball and currently plays in the top-level Greek Basket League. The local league includes a single division with two groups, one for Rhodes and the other for the rest islands, with 7 and 5 teams respectively. Three indoor courts exist in Rhodes City, and one each in Ialysos, Kremasti and Faliraki. Archangelos town will also get an indoor court according to Rhodes municipality planned works and regional government's approved funds. Rhodes competes in the bi-annual Island Games, which it hosted in 2007. Lawrence Durrell, writer and poet, author of the Alexandria Quartet, resided on Rhodes 1945-1947. In 1953 his travel book about Rhodes - Reflections on a Marine Venus - was published. ^ "Geography and Geomorphology - South Aegean". www.aegeanislands.gr. ^ "Rhodes, Greece, 1481". Jan Kozak Collection: KZ13, The Earthquake Engineering Online Archive. ^ "Earthquake's aftermath". Discover Rhodes. Retrieved 16 July 2008. ^ "Climatology - Rodos". Hellinic National Meteorological Service. Retrieved 24 March 2017. ^ "Rhodes Climate Normals 1961–1990". National Oceanic and Atmospheric Administration. Retrieved March 1, 2015. ^ a b "Rhodes, Greece - Climate data". Weather Atlas. Retrieved 24 March 2017. ^ B. d'Agostino, "Funerary customs and society on Rhodes in the Geometric Period: some observations", in E. Herring and I. Lemos, eds. Across Frontiers: Etruscans, Greeks, Phoenicians and Cypriots. Studies in Honour of D. Ridgway and F.R. Serra Ridgway 2006:57-69. ^ The Historical Library of Diodorus Siculus, Book V, ch.III. Retrieved 2010-01-24. ^ Sideris A., "Orientalizing Rhodian Jewellery in the Aegean", Cultural Portal of the Aegean Archipelago, Athens 2007. ^ Polybius (1889). Friedrich Otto Hultsch, ed. The Histories of Polybius. London: Macmillan & Co. pp. xxviii. 14, 15, xxix. 4, 7. ^ On Rhodes in antiquity see esp. R.M. Berthold, Rhodes in the Hellenistic Age, Cornell University Press, 1984. ^ a b c d e f Gregory, Timothy E. (1991). "Rhodes". In Kazhdan, Alexander. The Oxford Dictionary of Byzantium. Oxford and New York: Oxford University Press. pp. 1791–1792. ISBN 0-19-504652-8. ^ Kia 2016, p. 223. ^ Greatrex & Lieu 2005, p. 197. ^ Howard-Johnston 2006, p. 33. ^ Treadgold, Warren (1997). A History of the Byzantine State and Society. Stanford, California: Stanford University Press. p. 313. ISBN 0-8047-2630-2. ^ Treadgold, Warren (1997). A History of the Byzantine State and Society. Stanford, California: Stanford University Press. pp. 325, 327. ISBN 0-8047-2630-2. ^ Treadgold, Warren (1997). A History of the Byzantine State and Society. Stanford, California: Stanford University Press. p. 344. ISBN 0-8047-2630-2. ^ "Acropolis if Rhodes:Information". Retrieved 15 May 2013. ^ "Καθολικη Εκκλησια Τησ Ροδου". Catholicchurchrhodes.com. Retrieved 2009-03-22. ^ "T.C. Dışişleri Bakanlığı'ndan". Archived from the original on 3 September 2014. Retrieved 6 September 2014. ^ "History of Jewish Greece". Jewishvirtuallibrary.org. Retrieved 2010-01-24. ^ "The Virtual Jewish History Tour — Greece". Jewishvirtuallibrary.org. Retrieved 2010-01-24. ^ "Population & housing census 2001 (incl. area and average elevation)" (PDF) (in Greek). National Statistical Service of Greece. Archived from the original (PDF) on 21 September 2015. ^ "Bus schedule" (PDF). Ministry of Economy, Development and Tourism. ^ International Island Games Association website. Retrieved 27Jun08. Howard-Johnston, J.D. (2006). East Rome, Sasanian Persia and the End of Antiquity: Historiographical and Historical Studies. Ashgate Publishing, Ltd. ISBN 978-0860789925. Kia, Mehrdad (2016). he Persian Empire: A Historical Encyclopedia [2 volumes]: A Historical Encyclopedia. ABC-CLIO. ISBN 978-1610693912.